3 Speeches were given by different individuals who have recently graduated (or act as support communities) and what they have experienced so far from Roxanne Reynolds (@weareartam) , Liam Rollings (@TheDesignWire) , Hashmukh Kerai (@RoomCR6). Each of them highlighted their struggles through time how they encountered large fears/problems when they graduated ranging from simple concern for the future to rejections from universities and jobs due to lack of industry experience. 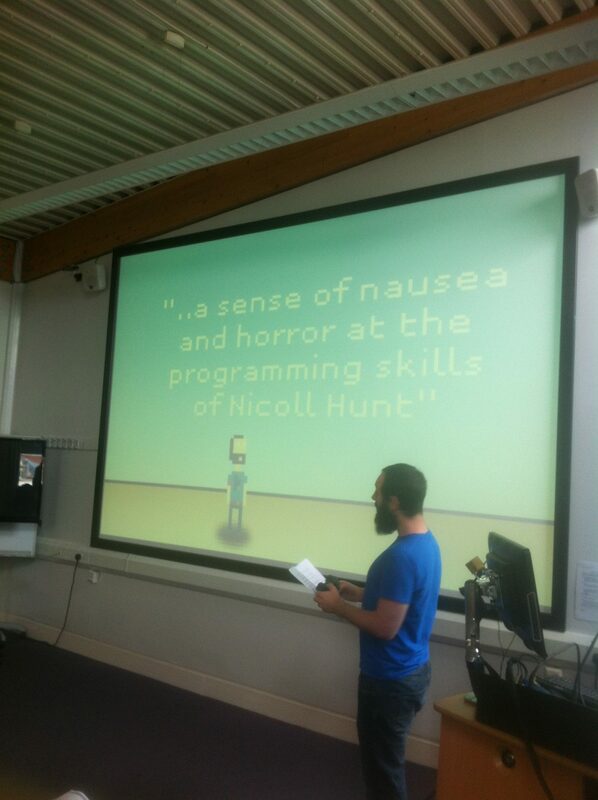 An amazing talk by Nicoll Hunt ( @NicollHunt) ( He is male!) an indie game developer that has been active for around 20 years accumulating a vast spectrum of industry experience, however his success did not come by easily as he received a lot of hate along the way with the most famous including a German newspaper attributing him as the world’s worst indie game developer (something along those lines…) in the world and various unpleasant hate comments on Youtube (which will most likely be used as a form of advertising for Nicoll game called ‘Fist of awesome’). The main message here was to always stay motivated and never completely sacrifice your income/current job for the sake of following your dreams. Charge a upfront fee (usually 30% but may vary) when providing a service. Be ‘ruthless’ when collecting payments. Do not tolerate latenesss. A very relaxed seminar given by Micci Gorrod from The Conscious Creative (@The_C_Creative) giving simple stress-relief techniques such as the muppet dance (personal favourite that I’ll surely implement into my own life 😀 ). Very deep subject that applies to all people & professions underlining the fact to live in the present & be aware of your surroundings instead of thinking constantly in the past/future. Thank you to those that attended it has a pleasure hosting you as well as a huge thanks to all the speakers that made the effort to come today to Accelerator to share their valuable knowledge/experience.